Last week I wrote about Flowviz, a workflow visualization plugin for ElectricCommander 3.8 that I put together in the course of one weekend. I was really pleased with how it turned out for the amount of time invested, but I felt that a little more work could really help round out the offering. So, after another weekend of effort (with no football game to distract me! ), I am proud now to present Flowviz 2.0.0. Configuration page which allows you to explicitly specify the path to the dot executable. New BSD-based license, so you are free to use and abuse flowviz any way you like. It turned out to be somewhat tricky to add the “+” links for the add transition operation. Under the covers, Flowviz uses graphviz to layout and render the workflow in SVG. Unfortunately, graphviz doesn’t provide a way to slap arbitrary additional elements into the render — basically, if you want something to appear in the image, it has to be either a node or an edge. My first attempt was to simply create an additional node for each “+”. That had two problems: first, graphviz doesn’t provide much control over the size of individual nodes, so I wound up with these big, mostly empty boxes for those nodes, even though they only needed to be big enough to contain the “+”. Second, graphviz doesn’t provide much control over the positioning of individual nodes. Although you can explicitly set the coordinates of a node to an absolute position, there doesn’t seem to be a way to set the coordinates relative to another node — obviously I want the “+” nodes to be close to the state they are associated with. So, I went back to the drawing board. Eventually, I came up with a new strategy: rather than trying to coerce graphviz to add the links, I would let graphviz do its thing, and then inject the links into the resulting SVG on the fly. SVG is just XML after all, and although it’s a rich language, the way that graphviz uses it is quite stylized. It was easy to scan the SVG output looking for the string class=”node”, the marker for the start of a new node description, then extract the coordinates of the box that represents that node and finally insert a new text element relative to those coordinates. The result is the image you see above: a small, unobtrusive “+” in the corner of each state. 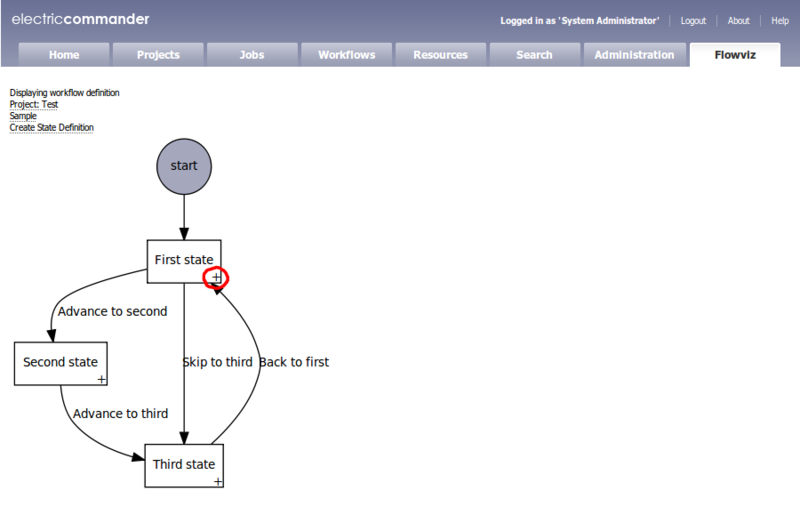 The workflow definition view does not provide a way to delete states or transitions. The active workflow view does not support manual transitions with parameters. Flowviz uses SVG to display the graph. Firefox and Chrome both support SVG natively, but IE requires a client-side plugin.